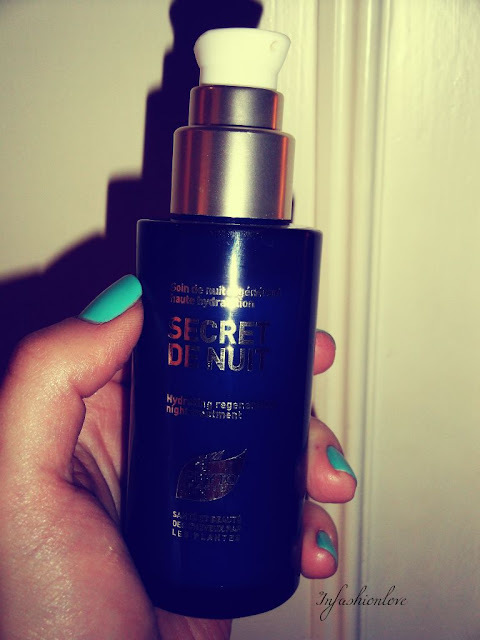 Secret de Nuit works over night regenerating dry hair while you are catching up on your beauty sleep... And when you wake up your the ends of your hair will feel softer and hydrated... It's silicone and paraben free, filled with 92 percent of botanical and natural origin ingredients, so it's quite a special hair product that will be very nice to your hair! It has Macademia oil, Ceramides, Essential Fatty Acids and Milk Thistle fruit extract to regenerate the hair... And Black Orchid extract and Grape seed polyphenols are the antioxidants that help the hair to detox... I also love the packaging, it looks like a luxurious skin care serum bottle... And although it's pricey it is worth it in my opinion and it would definitely make a neat gift for the loved ones or for yourself!